Class 7H : Bushey Middle School for this cyberhunt. This cyberhunt is for ages 10+. It is about rainforests. We hope you enjoy looking at our WebPages and that you learn something! 1. What plants and trees live in the rainforests? 2. Roughly how much rain does a rainforest receive each year? 3. What percentage of the earth's surface is covered by rainforests? 4. What things do we get from the rainforests? 5. Why are the rainforests so important for world ecology? 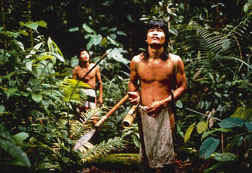 6. Who are the tribal people of the rainforest? 7. In what parts of the world are the tropical rainforests? 8. What are some of the causes and effects of deforestation? 9. How are brazil nut tree seeds spread? 10. How many ways do the people of the rainforest have of cooking meat and what are they?